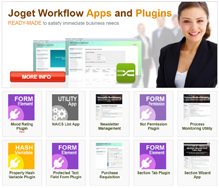 Joget Workflow Enterprise has a simple interface which makes learning easy for the user and administrator. As it is web-based and operates like a website (without multiple windows/pop-ups) we are able to navigate the system quickly and conveniently to access information or edit information from anywhere. Our Company is now able to migrate our business data onto Joget Workflow Enterprise, and can make do with fewer spreadsheets with the assurance that our data is secured, and not susceptible to risks such as file corruption.